“’Tis the prettiest little parlour that ever you did spy. This early 19th century poem by Mary Howitt paints a picture of a cunning spider trying to entice a fly into its web. In real life web-spinning spiders don’t try to inveigle flies, or any other form of insect, into their webs. Spider webs are spun across an area where prey is likely to fly or wander through, and (hopefully) blunder into (and get entangled in) the web. According to research, spiders collectively consume somewhere between 400 and 800 million tons of insects per year. Spider webs work pretty well then! Spider webs are made from spider silk which is produced from a number of silk glands located in the spider’s abdomen. The silk at this stage is a viscous liquid consisting of about 50% proteins and a mixture of other substances. The silk is extracted through special finger-like organs called spinnerets, which cause the protein molecules to align and form solid silk. Modern web-spinning spiders have three pairs of spinnerets and each pair does a different job. The silk from the front spinnerets is used for attachment points, drag lines, and in the construction of the main frame threads of a web. The middle pair of spinnerets produce swathing silk used to wrap up prey and spin egg sacs. The rear spinnerets produce the gluey silk used in orb web construction. Weight for weight, spider silk is up to 5 times stronger than steel of the same diameter. A silk fibre is approximately one micrometer in diameter which is about 80 times thinner than human hair. Male spiders often have fewer silk glands than female spiders – after all a male spider’s only purpose in life is to mate with females. Females need their full assortment of silk glands for web building, prey capture, and egg sac production. Orb-weaving spiders, such as garden orb-weavers (Eriophora spp. 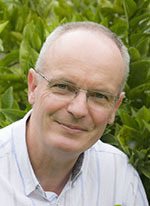 ), are very common in gardens, crops, vineyards and nurseries, and there are about 100 or so species scattered throughout Australia. 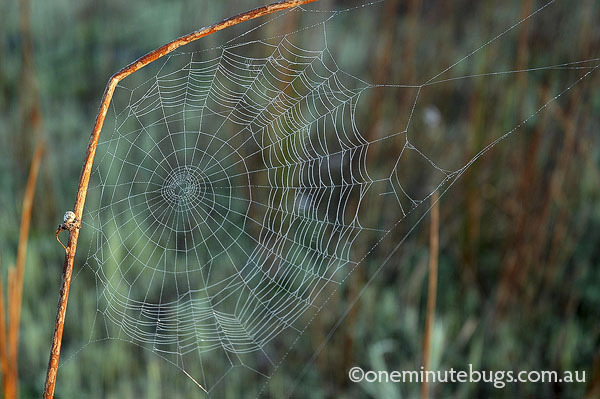 These spiders usually construct a web in the evening and take it down at dawn. These orb webs are stretched across open spaces, which begs the question: How does a spider get her first thread across that open space? She releases a long thread of silk which drifts in the breeze until it lands on something solid. If the attachment is to her liking she commences construction of the web proper, a process which takes about an hour. The web will be strong enough and flexible enough to stop a large insect flying into it at full speed. If the web was rigid rather than flexible it would break under such force. Garden orb-weaving spiders, like all other spiders are predators, meaning they are a beneficial presence in any garden, nursery, vineyard etc. The one in the image above has snared an Australian plague locust (Chortoicetes terminifera). A web building spider may produce an egg sac containing hundreds of eggs. When those eggs hatch into spiderlings you might think the web would become overcrowded, but spiders have a clever solution for this potential problem. The spiderlings release a thread of silk which is picked up by the breeze and the spiderlings ride the air currents. This technique is known as ‘ballooning’ and spiderlings may be carried high up into the stratosphere and travel thousands of kilometres. Sometimes there are mass ballooning events where many thousands of spiderlings descend on an area. There are numerous examples that will show up in a Google search. The media has a field day with these events, and they scare the living daylights out of arachnophobes everywhere. I guess nothing instills fear in arachnophobes more than the idea of venomous spiders raining down from the sky! Fear not – they are harmless baby spiders. My favourite web building spiders are the golden orb-weaving spiders (Nephila spp.) (pictured above). The ‘golden’ part of their common name refers to the colour of the web, not the colour of the spider itself. Their webs are huge, as much as a couple of meters across, permanent, and very strong. I know this from personal experience as I have blundered into them several times and basically bounced off! The webs are very complex, with a fine-meshed orb suspended in a maze of non-sticky barrier webs. Female golden orb-weaving spiders sit head down in the middle of their orb waiting for prey to fly into the web and get stuck on its sticky threads. After she consumes the prey the remains are stacked into a string of debris in the centre of the orb. There is some debate about the purpose of this debris string – one of the theories is the debris alerts birds to the presence of the web so that they don’t fly into it and break it. Finally, spiders shouldn’t be overlooked when it comes to insect pest management. I was amazed by the number of spiders I found in vineyards during my time with an Integrated Pest Management consultancy. In many cases spiders were the most numerous beneficial organism by far. Spiders are good! 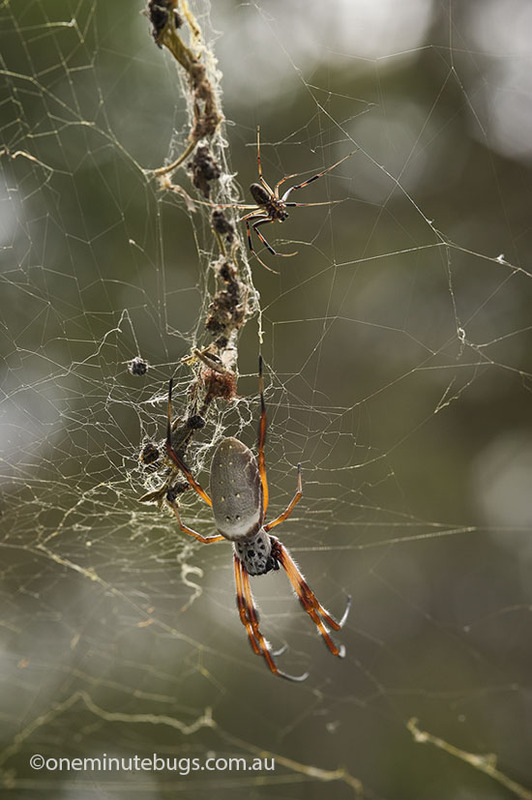 This entry was posted in Arachnid, predator, Spider and tagged Nephila, orb-weaving, spider by denisjc. Bookmark the permalink.